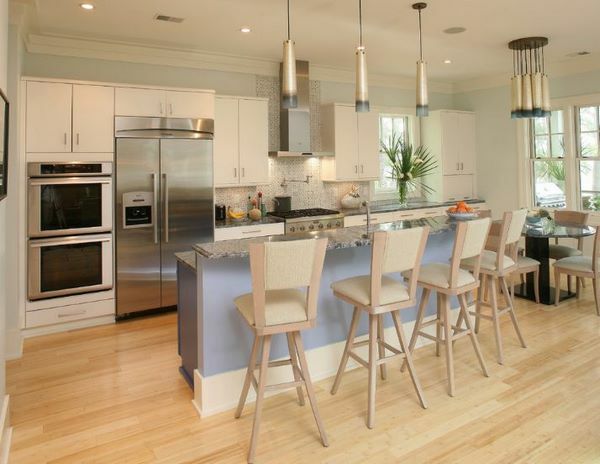 Whether you plan a kitchen remodel or you are looking for the best kitchen flooring ideas for your new home, you shall be faced at a variety of options. 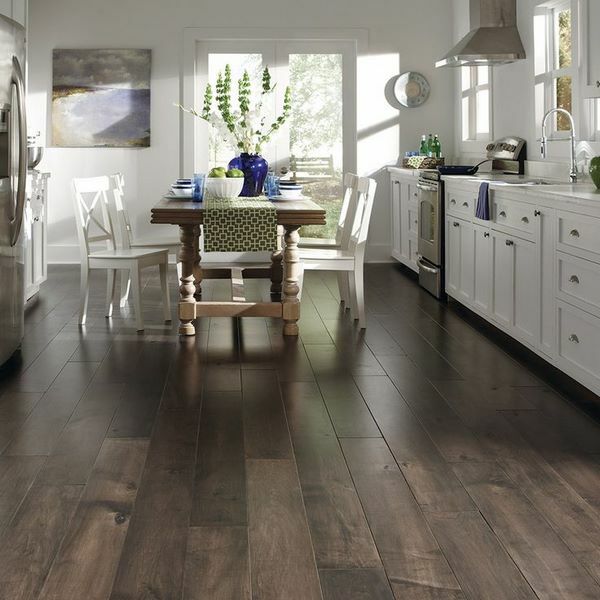 What will be the floor in your kitchen? The choice depends not only on the style of the interior which is important, of course, but you need to make sure that there is a suitable foundation for the floor that you have chosen. Is the sub-floor level? What type is it? Very often homeowners do not realize that this is very important and will determine the service life of the kitchen floor. 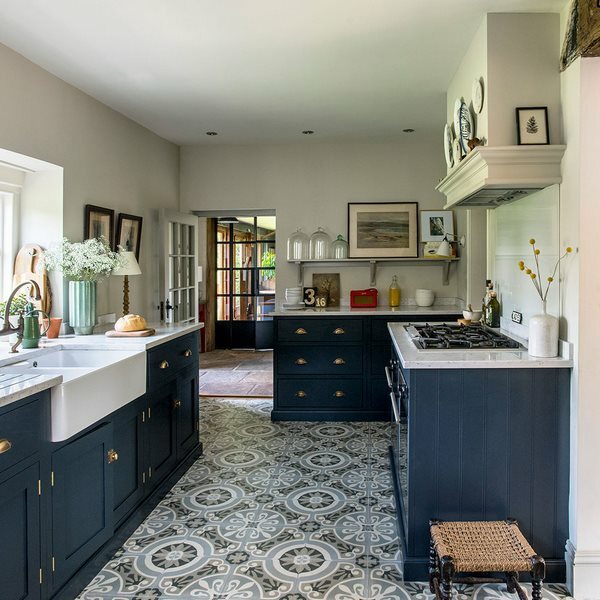 Do you want a spectacular looking floor which will be a visually pleasing and decorative element in your kitchen or you prefer a more subtle option which will serve as a background and blend in the overall decor style? 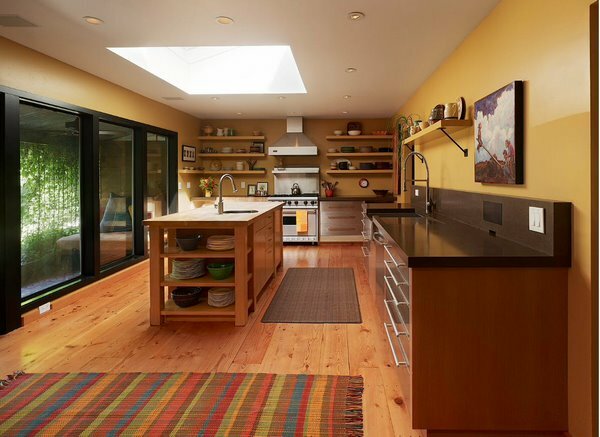 Do you want to a warm floor in the kitchen? In this case you need to use only those types of materials which are specially designed for heated floors and have high thermal conductivity. Very often designers offer combined flooring but before making your final choice, it is better to consult a specialist. 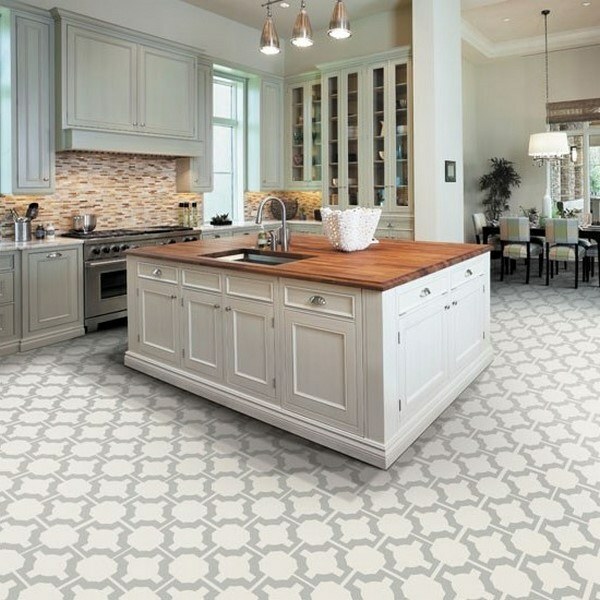 In this article you will find out a lot of useful information for the top kitchen flooring options, their advantages and disadvantages and specific requirements. 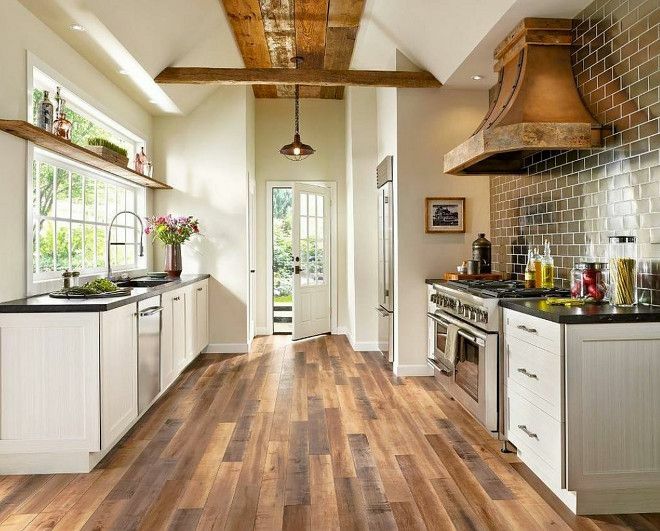 What are the general requirements for kitchen floors? The kitchen is a room where a lot of activities take place and the floor has to endure a lot of daily tests – contact with splashes, grease, constantly moving chairs, etc. 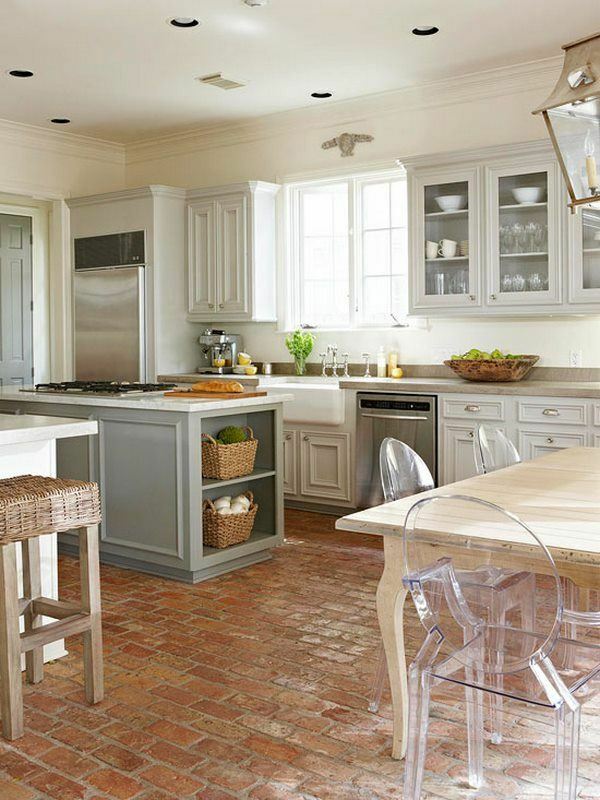 The ideal kitchen floor should not be afraid of fat, moisture, or accidental scratches. It is easy to wash and stains do not stay on it. Moisture resistance – in terms of humidity level, only the bathroom overcomes the kitchen area, and besides this, liquids are sometimes spilled on the kitchen floor. Shock resistance – drops of sharp and heavy objects sometimes happen in the kitchen so the floor should not be destroyed of you dropped a knife or a cast-iron frying pan. Fire resistance – the general flooring requirement is that any floor should withstand fire for a period during which the occupant can get out of the building. 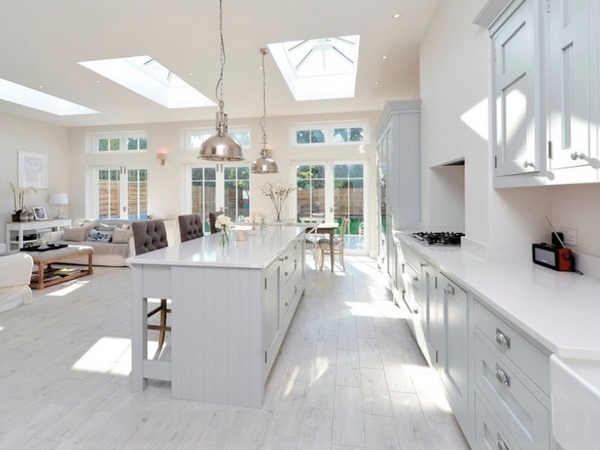 Anti-slipping properties – this is an important requirement for a kitchen floor as drops of water are almost constant and it is very easy to to slip. Thermal insulation– A cold floor is unpleasant in any room and when you walk into the kitchen to make a cup of coffee in the morning, it will be quite a shock to your bear feet. You can choose between various materials that a warm to barefoot walking or install under floor heating. In such case, make sure that you choose a suitable material which will not block the heat. 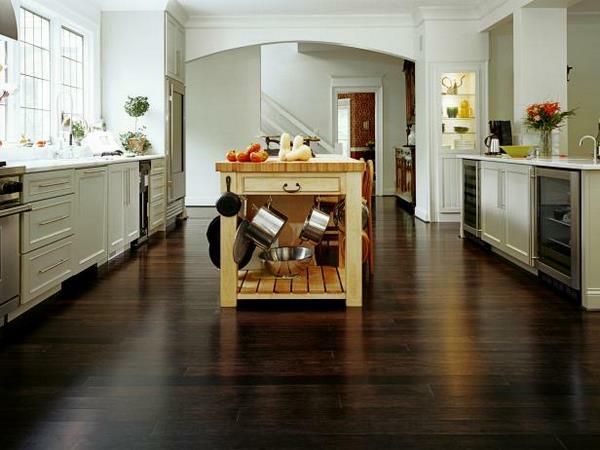 Price – the ideal floor in the kitchen is not necessarily expensive and an expensive flooring is not necessarily perfect. Even the most expensive material may turn out to be a wrong choice for your kitchen. Ease of installation – which type of flooring can be installed as a DIY project and which one requires professional installation. Appearance – the choice of flooring design is a matter of taste and personal preferences. 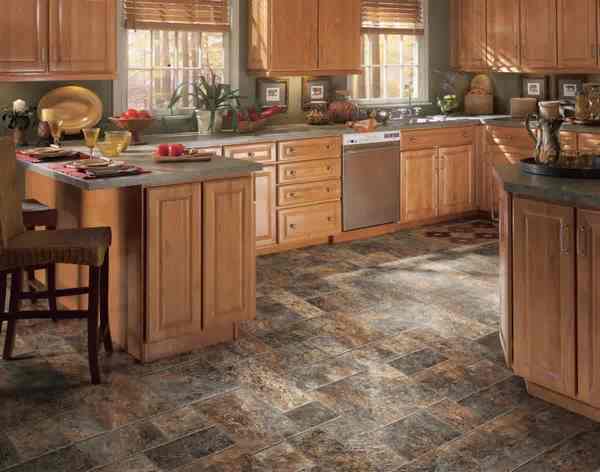 However, the flooring, its color and texture should be in harmony with the style of your kitchen. 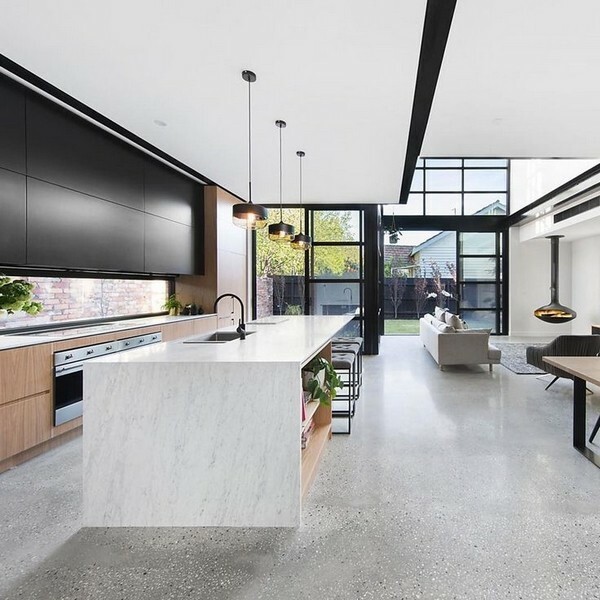 For example, a polished concrete flooring will be ideal for a contemporary or minimalist kitchen while a hardwood floor will be the perfect choice for almost any style – rustic, Mediterranean, traditional, modern, etc. The size of the room is also important and should be kept in mind. 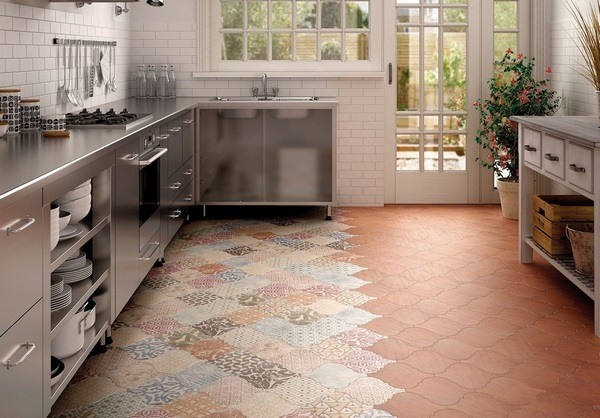 Large tiles or drawings reduce the size of the kitchen visually. The basic rule is that the smaller the size of the room, the smaller the elements of the tiles or the decorative pattern and images. Flooring with a glossy finish increases the volume of the room visually while a matte finish can make it appear smaller. 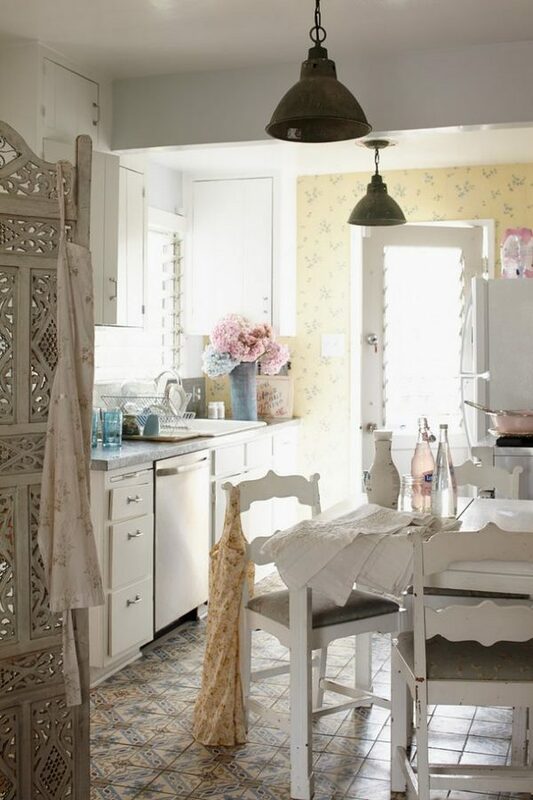 For a small kitchen, it is worth choosing a homogeneous floor covering. Such a floor will help visually increase a small space and make it more harmonious. Colors are important for the atmosphere. For example, if you want to create a feeling of coziness, choose warm or neutral colors. Guided by basic knowledge for the characteristics of floor types and materials and your sense of taste you can create a real masterpiece in the kitchen. 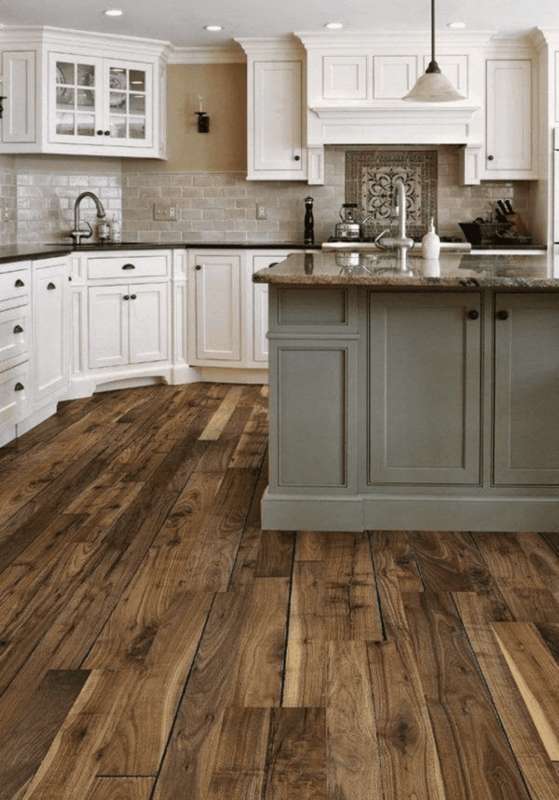 Let’s look at what types of flooring are suitable for the kitchen and what you need to know in order to make the right choice. 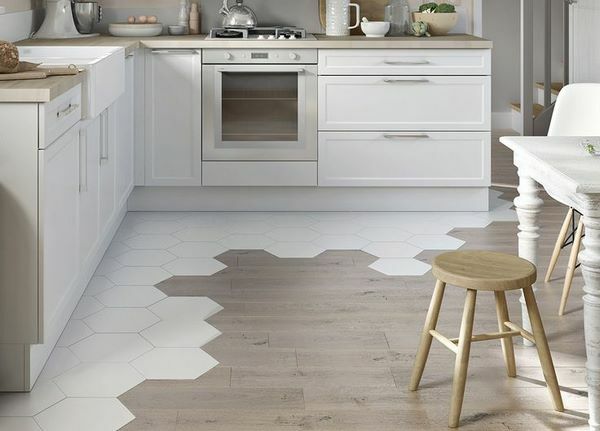 Nowadays the market offers so many options for kitchen floors – from traditional tiles, hardwood and brick to laminate, cork, marmoleum, linoleum, etc. 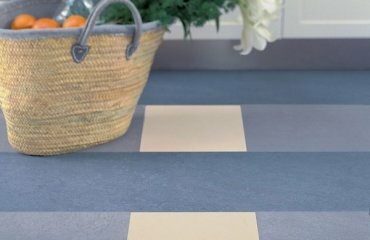 Each of these materials has its own advantages and disadvantages, especially when you plan to use them as a floor cover in the kitchen. 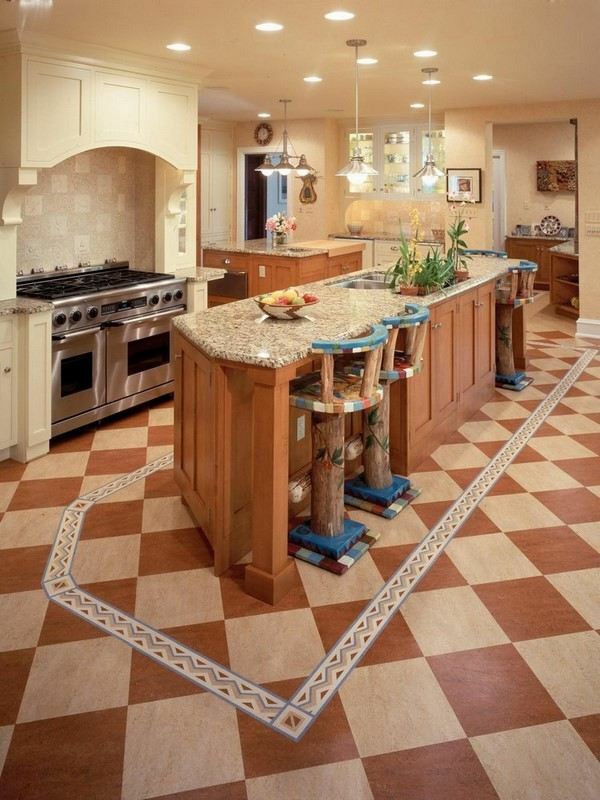 Kitchen tile flooring is, perhaps, the most popular floor covering solutions. It is very practical and convenient, it is inexpensive and gives numerous options for design experiments. Floor tiles come in a huge range of sizes, colors, prices and styling. 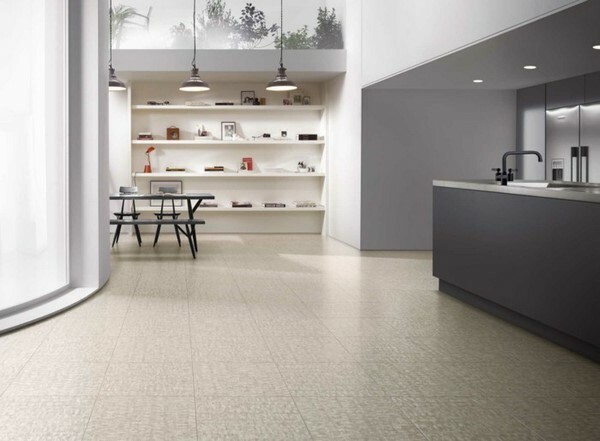 Resistance to chemicals – kitchen tile floors are resistant to most domestic cleaners but you need to be careful not to use detergents containing harmful, chemically active substances, as this may damage the surface of the tiles and affect the aesthetic appeal of the floor. Price – tiles are among the most affordable flooring options. Depending on the quality, prices may range and some types may be more expensive than laminate or linoleum. With all the advantages tiles also have a few drawbacks. The most significant one is “coldness”. 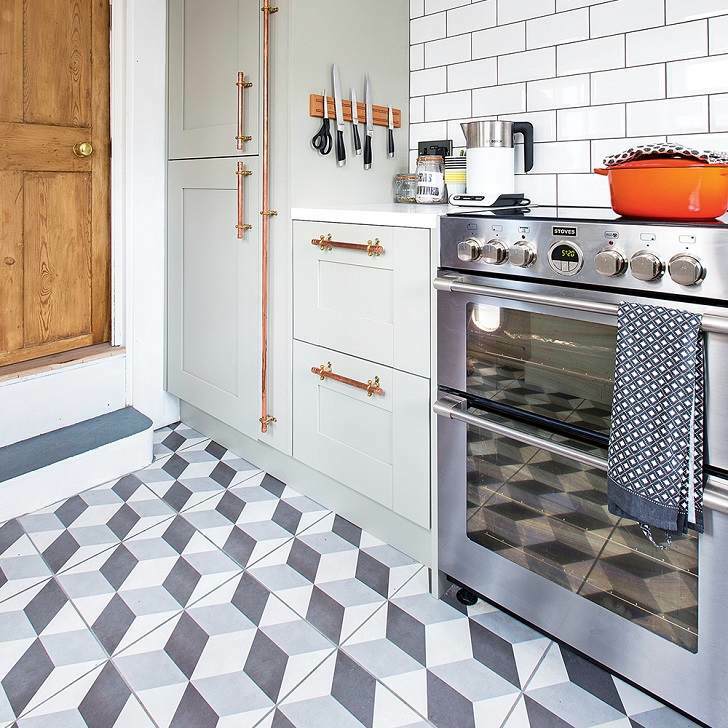 Tiled floors are unlikely to suit those who are used to walking barefoot at home or who have small children. 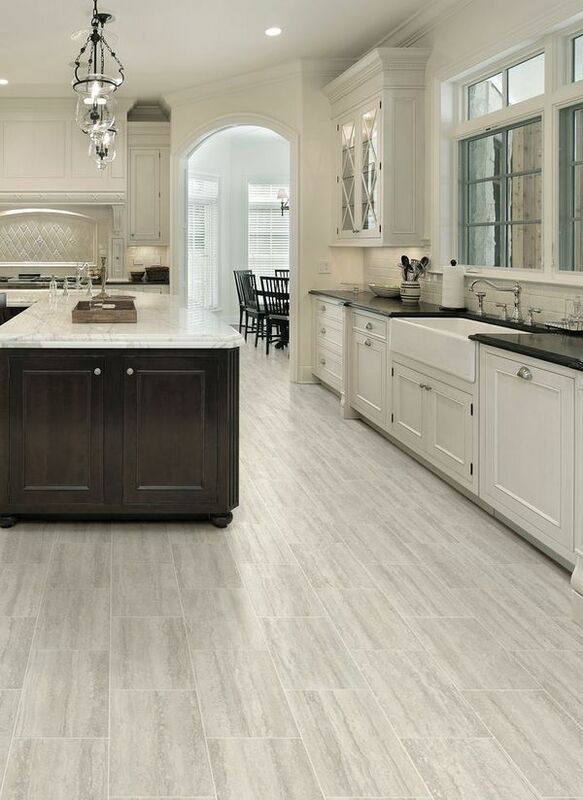 When choosing tiles for your kitchen flooring it is better to opt for matte, unglazed tiles, which are non-slippery. Installation requires a level concrete sub-floor, if there are voids between the floor surface and the tile, it may break if hit by a heavy object. In addition, laying tile flooring requires specialized tools, knowledge and skills, so the cost of the floor will increase with the labor cost. 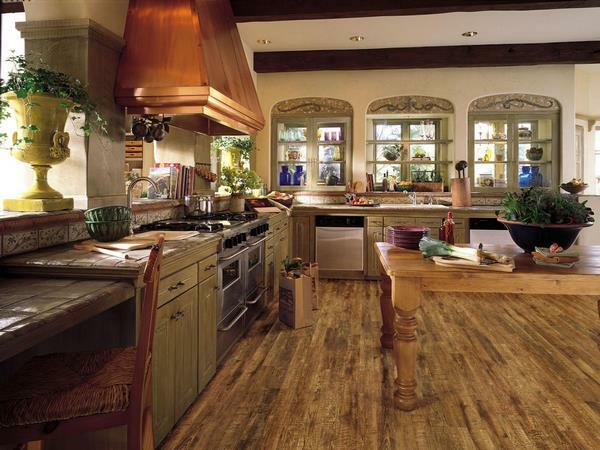 Floors from natural wood are not cheap, but thanks to them the interior of the kitchen looks rich and respectable. 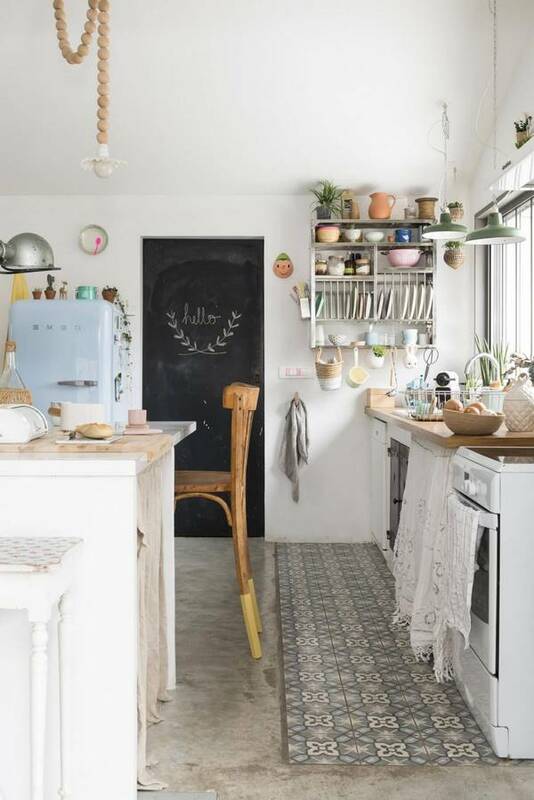 The wooden floor perfectly complements a rustic kitchen or a kitchen in a traditional style, because it perfectly matches with wooden furniture and accessories. You can choose different options – reclaimed wood, which has a lot of character, budget friendly plywood, exotic hardwoods, durable oak, wide planks, even elegant parquet. Hardwood floors are warm, comfortable and pleasant, and in addition, they are environmentally friendly. Further to that, solid wood floors are strong and durable, they can be sanded and refinished and with the right care, they can last for decades. However, if you are dreaming of beautiful hardwood kitchen flooring you have to be prepared for the fact that it will require constant care and regular processing with special wood protection products. Wood floors do not like moisture and temperature changes. Wood is porous and easily absorbs dirt and moisture. These floors are susceptible to staining as well – fruit juice, wine or water can leave marks on the surface of the boards, which are very difficult to clean. A significant disadvantage of the wood floor is the high price. 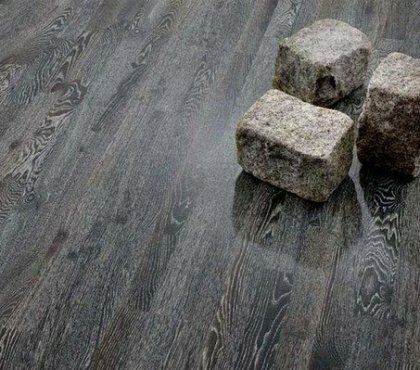 This flooring option is really budget friendly, but the amazing appearance comes at a price and its beauty and ecological compatibility can hardly be beaten. 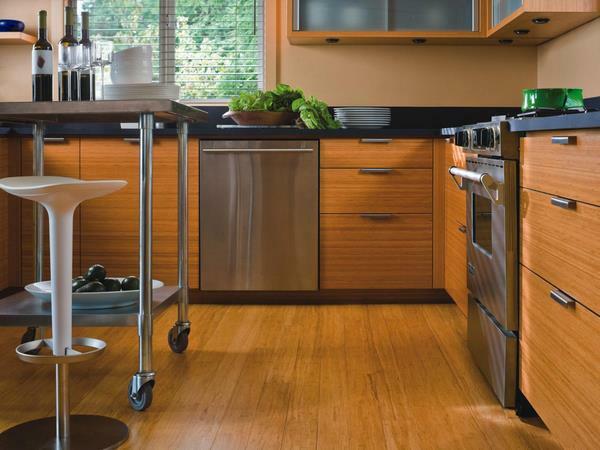 Laminate is the alternative to the solid wood floors in the kitchen. Laminate is able to imitate all types of wood grain and texture, including precious and exotic species. Some types of laminate quite successfully imitate even granite, marble and tiles. 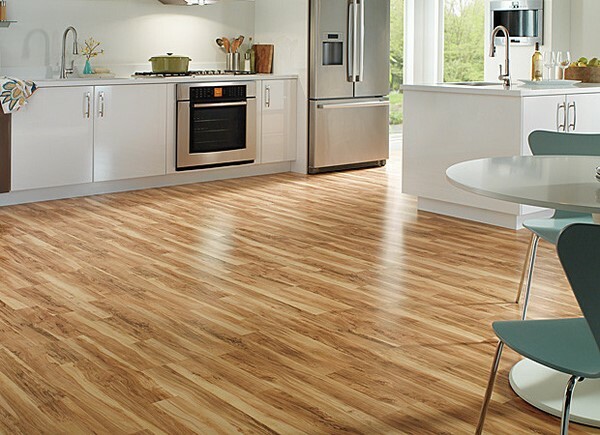 Laminate flooring is suitable for the kitchen area as it is durable and resistant to temperature changes, abrasion and high foot traffic. Compared to natural wood, laminate has a better water resistance, but high humidity levels and excessive moisture can damage it. 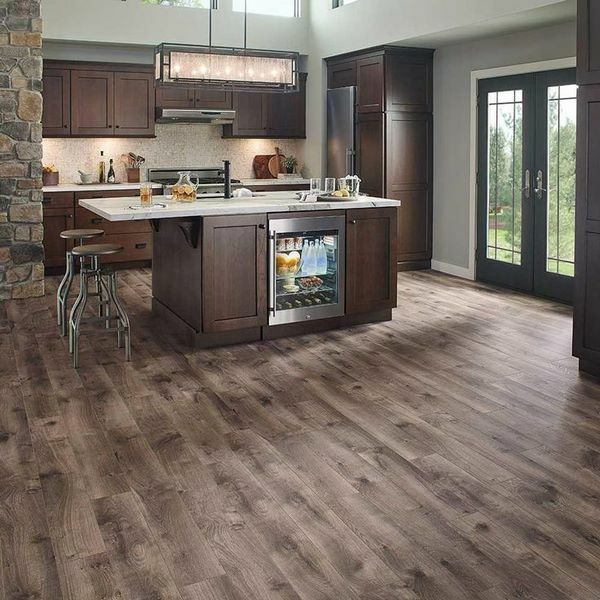 Nowadays the market offers moisture resistant laminate with increased water repelling properties which is a better option for kitchen flooring. Laminate floors are not afraid of moisture, scratches and stains and have a long lifespan. The lightweight is one of the major advantages and if you are looking for a DIY flooring option, this would be an excellent choice. Another major advantage of laminate when compared to hardwood is that it does not need any sanding, staining, waxing, sealing or polishing or treatment with protective chemicals and is extremely easy to maintain clean. 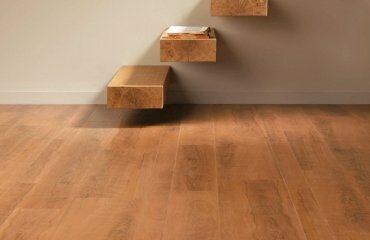 With regard to the environmental safety of laminate flooring, it is important to choose high quality products from manufacturers with a long history and a good reputation. Experts advise you to always ask the seller for instructions and hygienic certificate when buying. 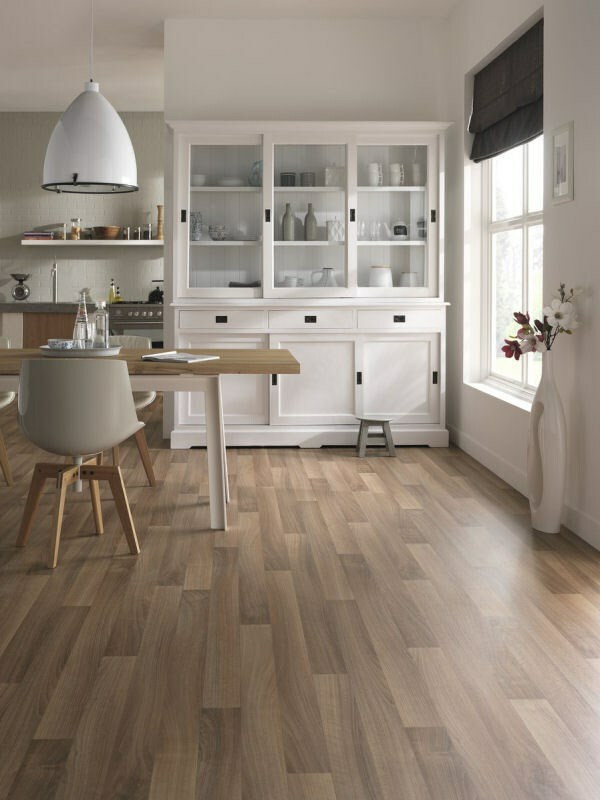 Another important property of the laminate – it allows you to have a warm floor in the kitchen. At the same time, it is quite affordable and more budget friendly. Laminate floors, however, can be very slippery, which is families with young children and pets should keep in mind and these floors can be quite “noisy” too. 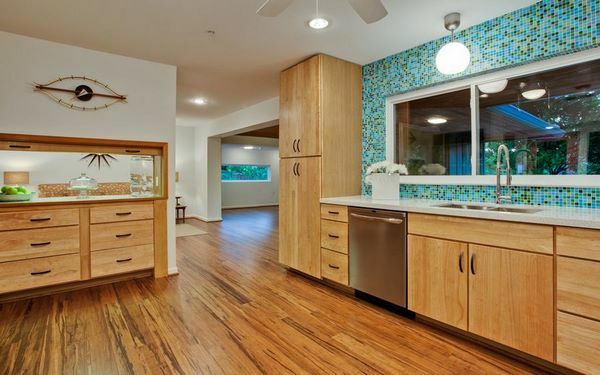 Compared to hardwood, bamboo flooring is more affordable, it comes with a lower price tag. 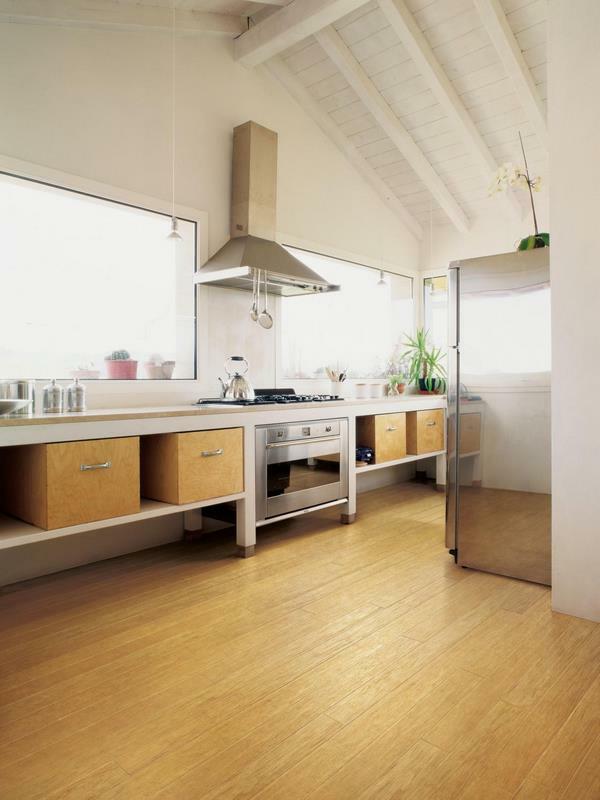 Bamboo floors are long lasting and durable, but they can scratch and dent. 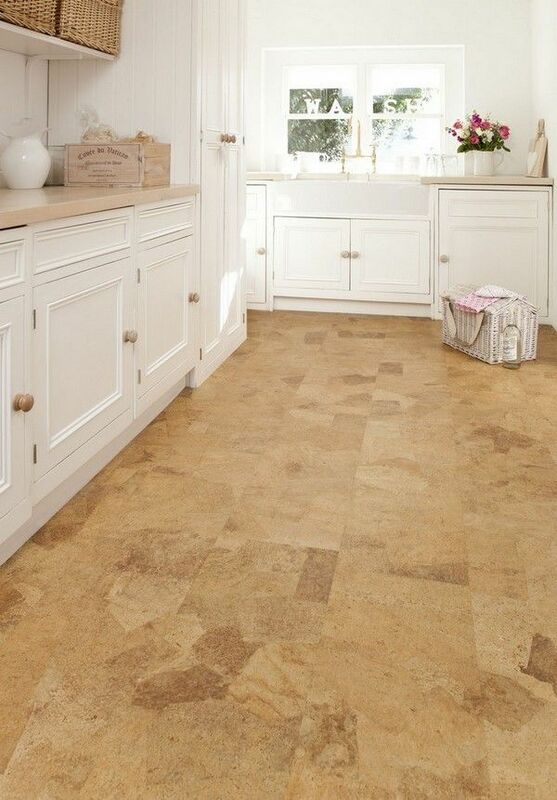 Cork floors are hugely appealing to lovers of natural and environmentally friendly materials. Cork is made from the bark of cork oak, which is removed from the growing tree every few years. Cork floors are very comfortable for the feet and help reduce the strain on the joints and spine. Although this material has many advantages and benefits to offer, we see it more often as a choice for living rooms and bedrooms. 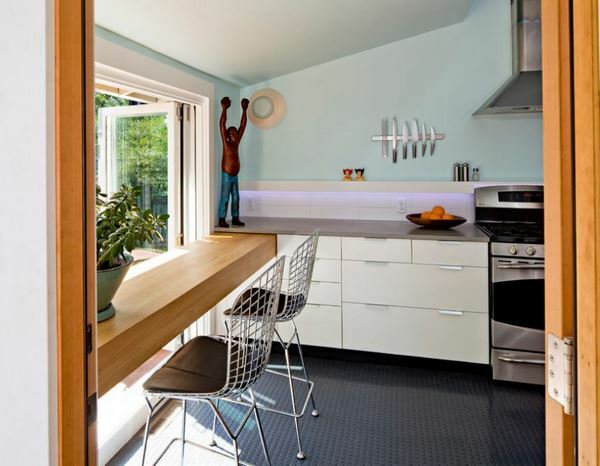 However, you will see now that it can be a great addition to your kitchen design as well. 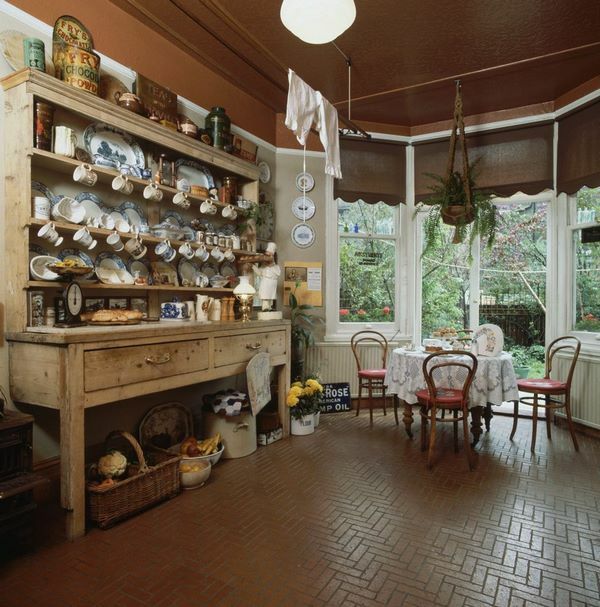 Cork floors, when treated with a special varnish, can be the perfect choice for the kitchen. When installed correctly, the floor is not afraid of moisture and is quite capable of surviving small spills of liquid. 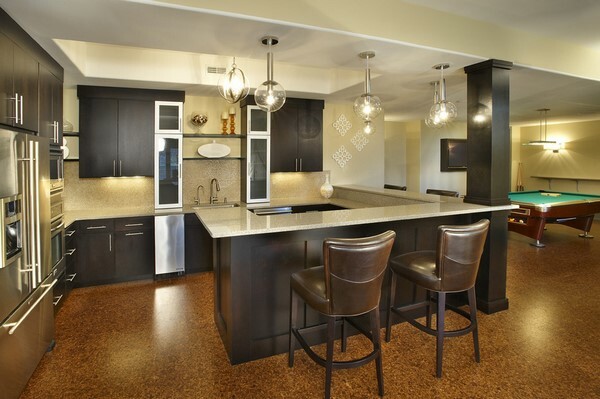 Cork is exceptionally warm to the touch and has excellent insulating properties as well. Since the cork is a natural anti-static, it practically does not attract dust. Cork floor surface is not slippery, it is fire resistant, rot resistant and not afraid of scratches. 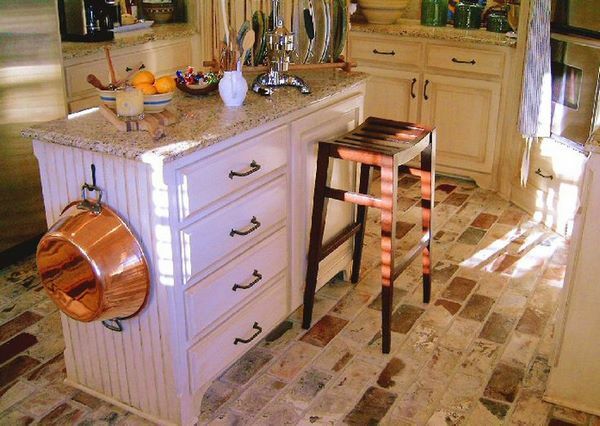 Maintenance – Cork flooring in the kitchen is easy to clean, besides it is resistant to stains. You do not have to seal, stain or refinish this flooring. Cork, as a flooring material, has one major disadvantage – it is easily pierced by sharp objects and heavy objects will also leave a noticeable trace. 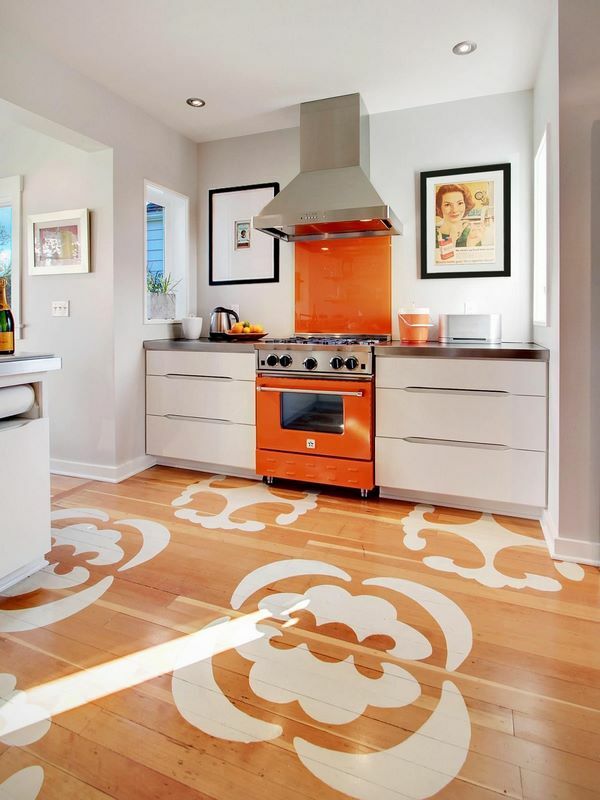 What is important to know about linoleum kitchen floors? 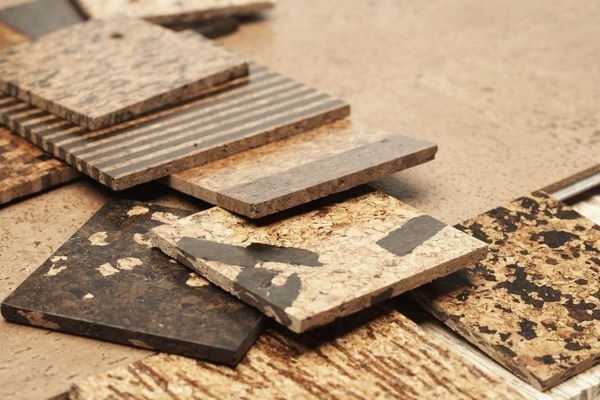 Being a product made of natural materials, real linoleum is environmentally friendly, biodegradable, non-toxic, recyclable and is perfectly safe for human health. Experts advise not buy cheap linoleum. Pay attention to the smell – the stronger the smell of linoleum, the lower its environmental safety. Carefully read the label and description as some types of linoleum can be used only in non-residential premises, for example, on a loggia. 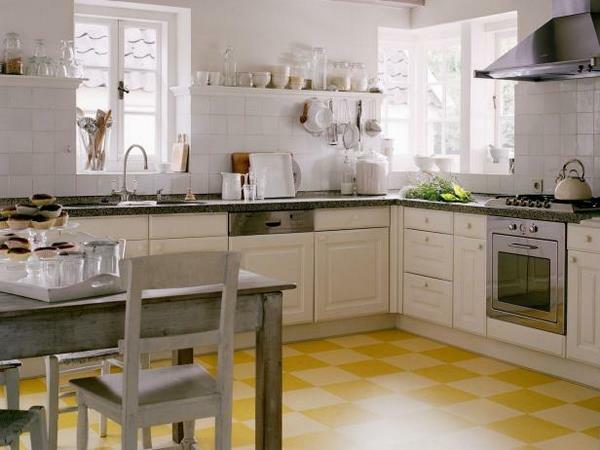 Linoleum kitchen floors are distinguished by their durability, wear resistance, good heat and sound insulation. 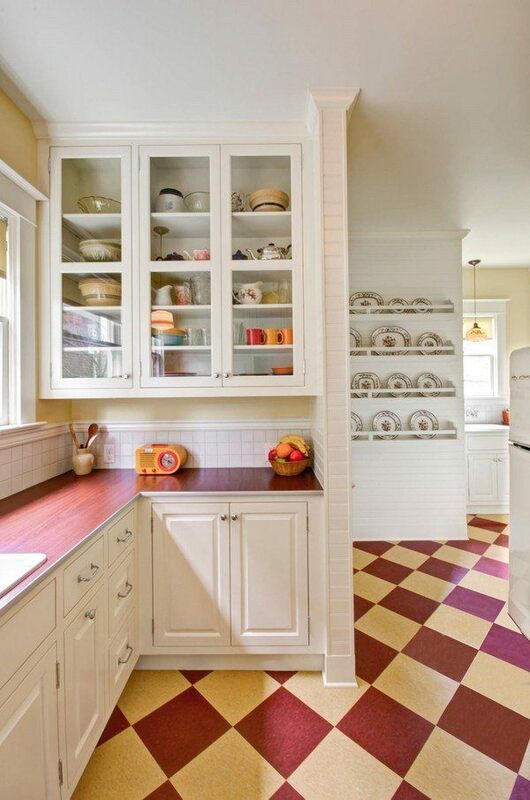 When shopping a kitchen floor covering, choose high quality linoleum which has a thicker protective layer. When properly maintained, your linoleum flooring can last for many years without losing its color. Linoleum is very unpretentious in terms of maintenance and care. It is easy to wash, and this is an important plus for any kitchen floor. Regular sweeping and mopping is all that your flooring will need. The big advantage of linoleum is that it is easy to install it on your own. 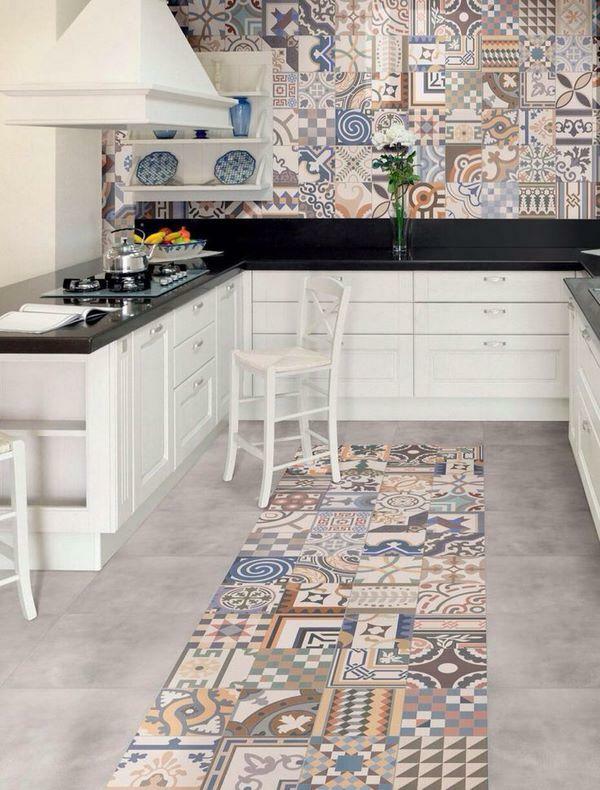 It is manufactured in sheets and tiles so you can create your own original floor design and experiment with colors and patterns. Appearance – nowadays manufacturers today offer linoleum in a variety of colors, patterns and textures. 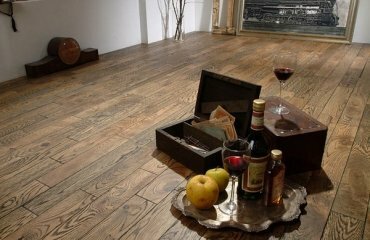 For example, it can imitate parquet, wood, stone and even metal. If you chose linoleum tile you can create different patterns and ornaments. The attractive price is also a huge advantage, as linoleum is significantly cheaper than most flooring options. On the minus side, one of the main cons of linoleum is that it is not resistant to moisture and is susceptible to water damage. It is a soft material and is easily torn, punctured, pierced and cut by sharp objects. 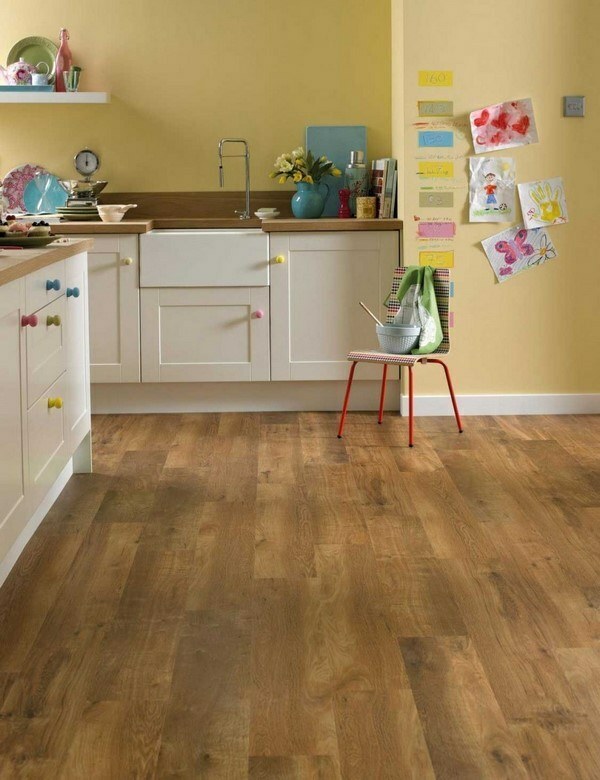 Vinyl is one of the cheapest kitchen flooring options. It is versatile and economical and comes in two varieties – sheet and planks. Many people associate vinyl with the past when it was hugely popular not only as domestic flooring but was used in commercial and public areas as well. With the development of technology, the variety of patterns and colors which are available to choose from is, practically, endless. You can choose a model that imitates natural stone, wood, parquet, tile, leather, carpet, fabrics and anything else you could think of. Vinyl floors are practical, durable and offer relatively good insulating properties. There are no echoing footsteps, no clattering, no squeaks. They are resistant to stains, abrasions and moreover the non-slip coating makes them safe for small children or elderly people. Vinyl is water resistant and is not afraid of spills. However, the seams between the vinyl tiles are the weak spot so it is so important to carefully seal them to prevent direct contact with water. Easy installation is another great advantage. Like linoleum, vinyl flooring is an excellent DIY project especially if you look for “peel and stick” floor tiles. 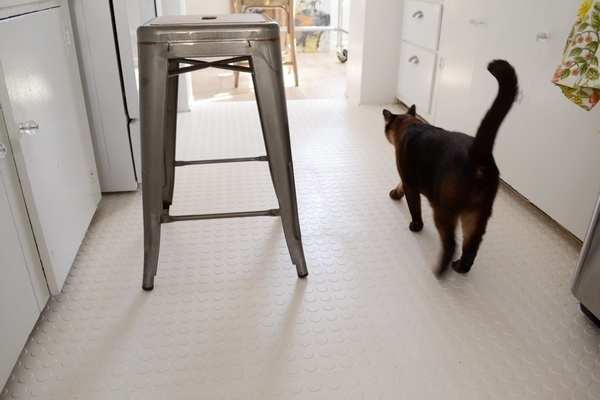 Comfortable feeling – despite the fact that the vinyl floor is a synthetic material, it is very pleasant to walk on it. The surface is warm and gently springing underfoot. Easy to clean – sweeping and wet cleaning is all your floor will need. The biggest disadvantage of vinyl floors is that they are not environmentally friendly. The material is made of petroleum products and when burning, vinyl emits toxic gases. Another disadvantage is that once damaged, the floor can not be restored. You need to remove it and change the floor covering with a new oneq especially if you opted for sheets. With vinyl tiles the situation is somewhat simpler – just remove the damaged tile and replace it with a new one. When in contact with rubber the surface of vinyl is easily stained. This is the result of a chemical reaction, so it is impossible to remove them. Vinyl is also damaged by various kinds of solvents and acetone and when exposed to sunlight its color starts fading. 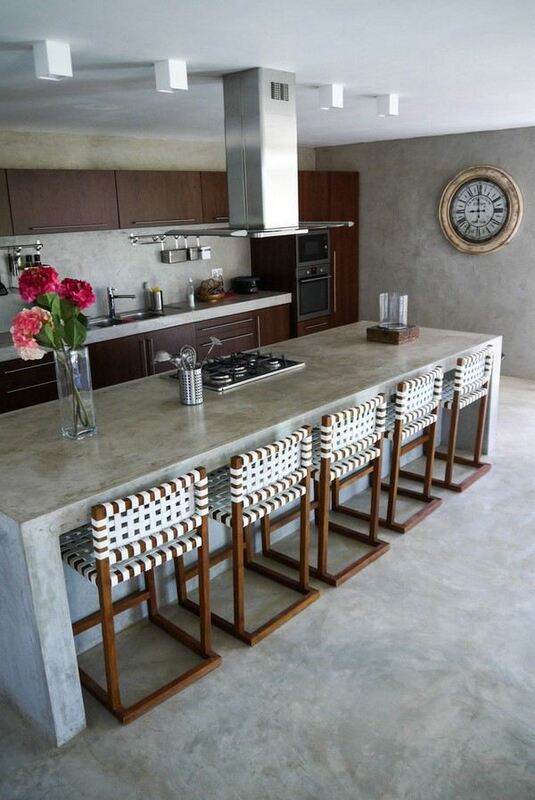 Concrete floors for kitchens are another economical and affordable option. Such floors are very durable and do not attract dust. 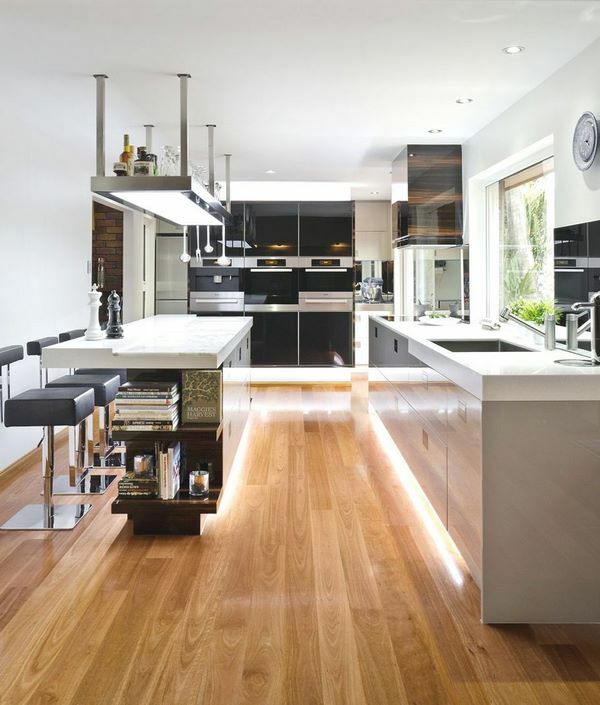 This is the ideal choice for Industrial kitchen designs as well as minimalist interiors. 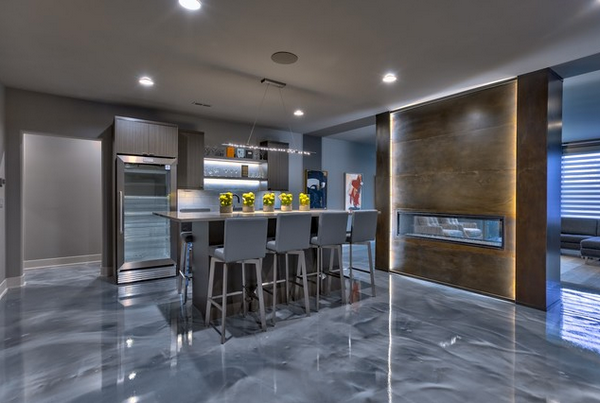 Durability of concrete floors is one of their main pros. It is hard to damage a concrete floor, it is resistant to mechanical damage, scratches and will not be easily chipped if you dropped a heavy pan. Another advantage of concrete is that it is is safe to human health. 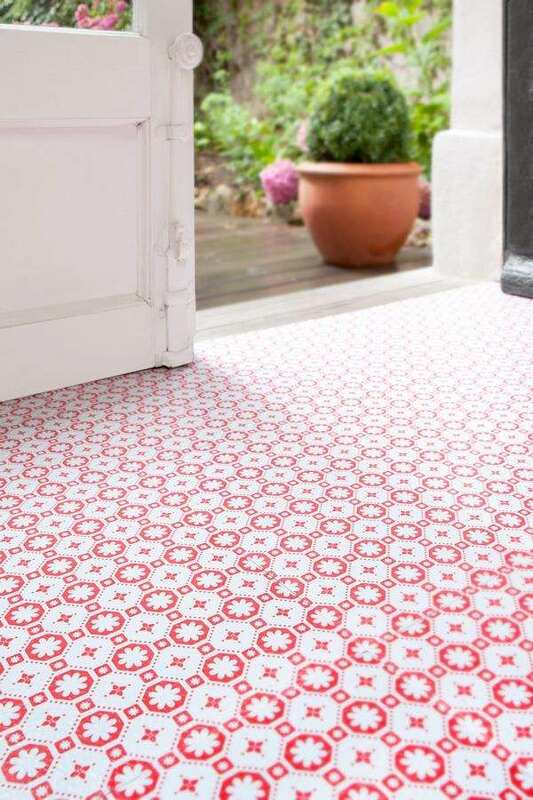 It does not emit any harmful substances which is the reason why many people choose it as a kitchen floor covering. In terms of maintenance, concrete floors do not require anything more than sweeping and mopping but they are susceptible to moisture penetration if not sealed properly and eventually crack. 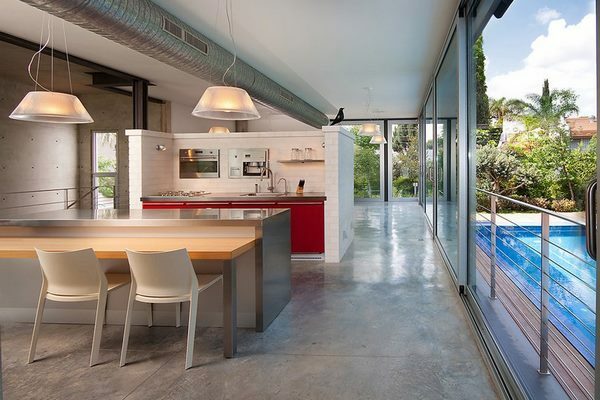 Visual appearance – nowadays you can choose a polished concrete floor, a textured pattern for your kitchen or paint it in any color that will work with the overall design concept. If properly maintained your concrete floor can last forever. Despite the many advantages concrete floors have a few drawbacks. Everyone knows that concrete is a cold material, so additional flooring or insulating materials is needed. Further to that these floors are hard and not very convenient if you have to stand on them for a long time. It is unlikely to damage the floor if you dropped a knife or a pan, but if you slip and fall, you may hurt yourself. 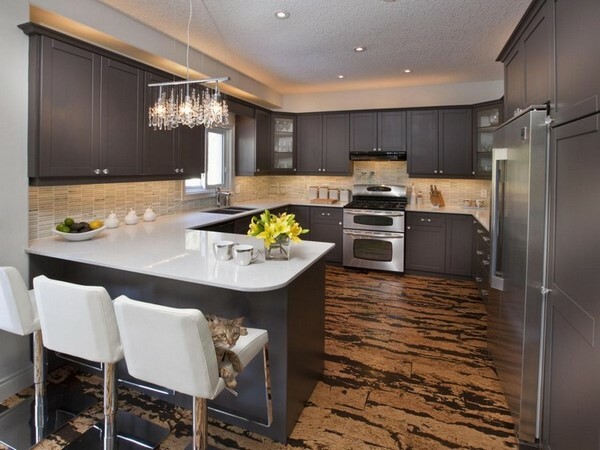 Terazzo kitchen flooring is ideal for all homeowners looking for a strong, durable and lasting floor covering. Terazzo is a self-leveling floor mosaic, it can be manufactured on special plates or as tiles. The material is widely used in public areas due to its incredible durability but when you want a beautiful, sleek flooring for a contemporary interior, terrazzo is something worth considering. 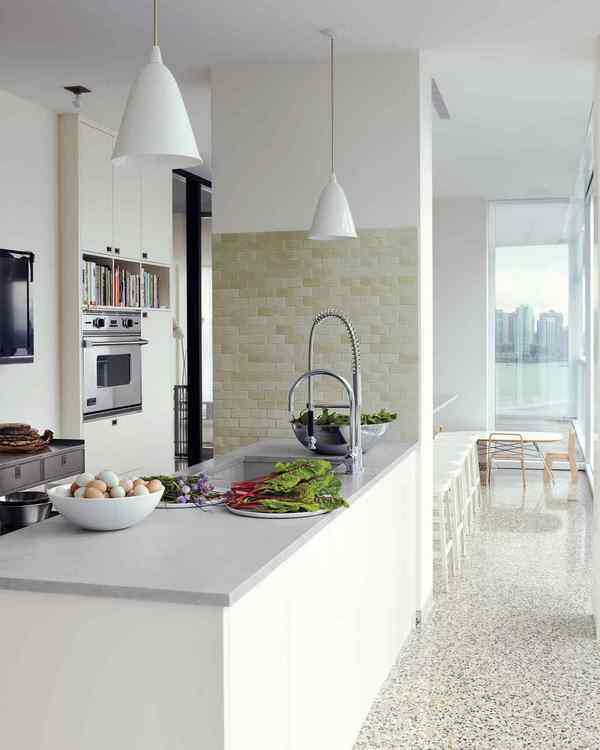 From a practical point of view, terrazzo flooring in the kitchen will offer you many benefits. It is non porous, which makes it absolutely water resistant, as well as stain-resistant. In addition to that, terrazzo floors are non-flammable, resistant to abrasion, they have a very long life span – 30-40 years, and environmentally friendly, as the material is recyclable. 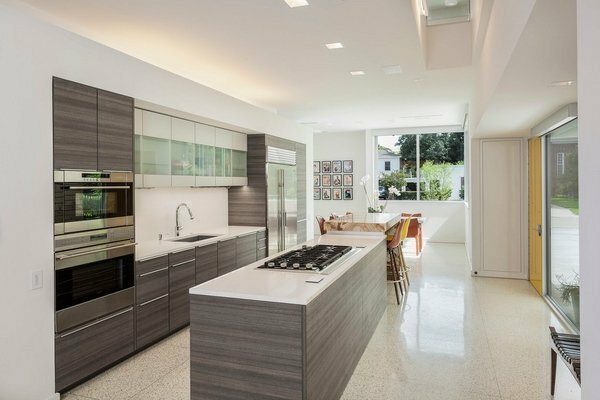 Terrazzo floors are hygienic and dust-free so the flooring requires simple and easy care which is important to know, especially when we are talking about kitchen floors. As far as appearance is concerned, Terrazzo flooring has a seamless, perfectly smooth surface and you can choose from a large range of colors and combinations. 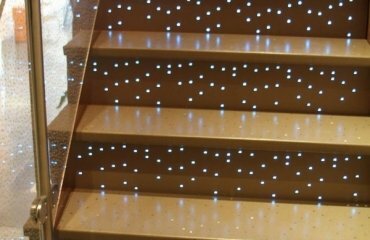 One of the major considerations is that the installation of these floors requires special tools and very expensive equipment, as well as experience. 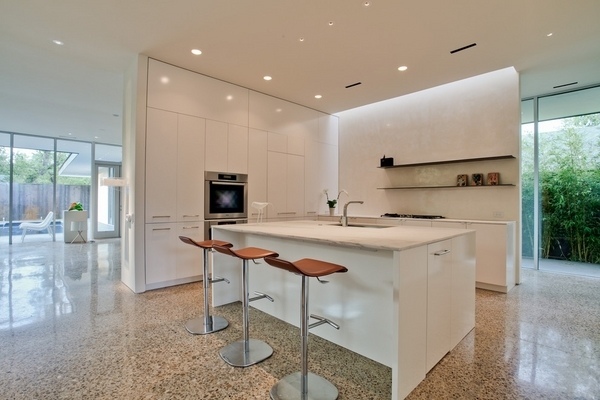 Getting terrazzo tiles is an option if you prefer a more budget friendly option. 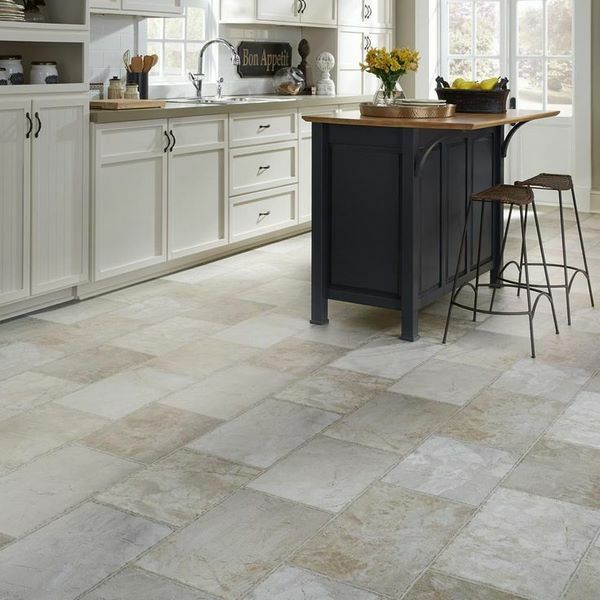 Natural stone kitchen flooring looks luxurious, noble and unique. 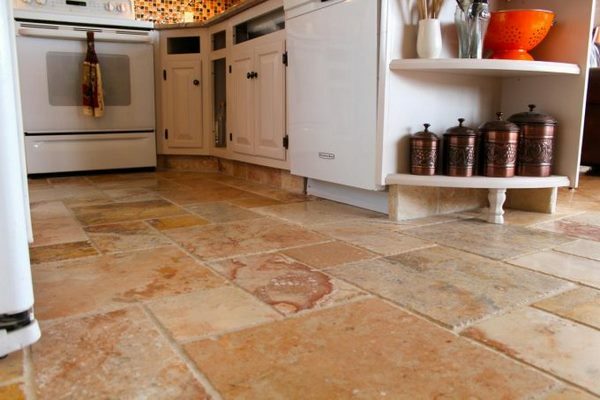 Natural stone is used as a floor covering material since ancient times. 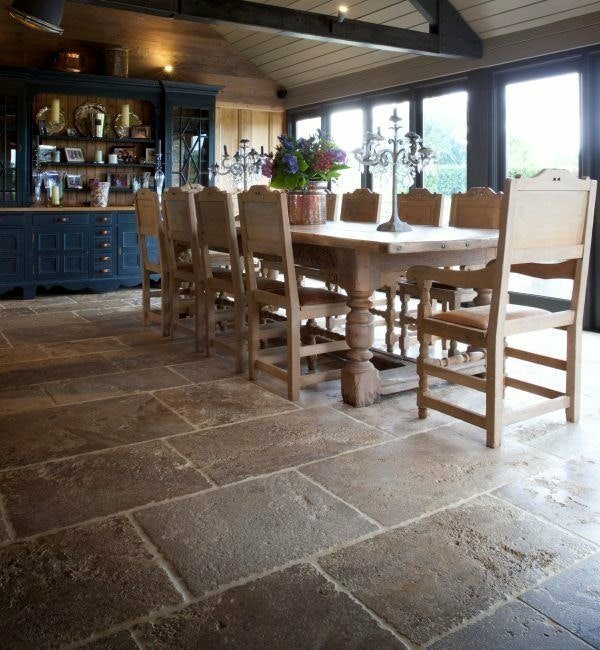 What are the advantages of stone floors and what type of stone is suitable for kitchens? 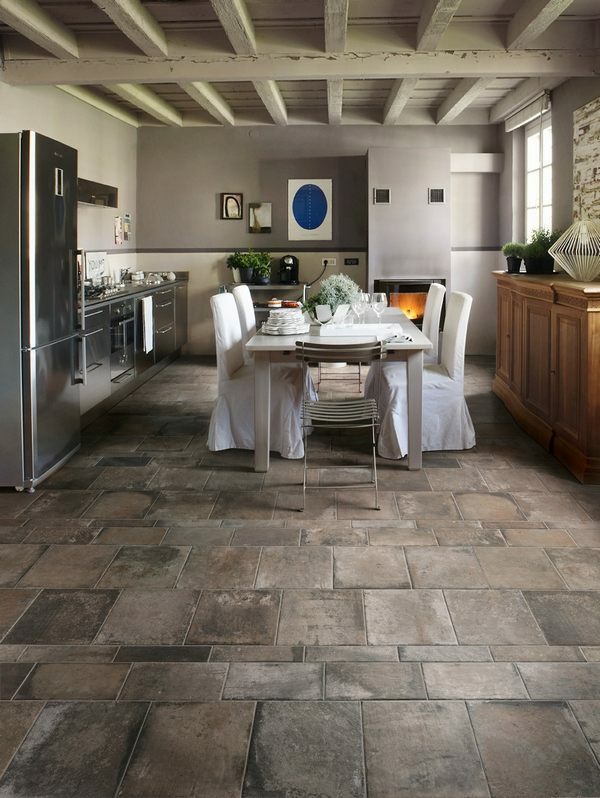 On the first place, stone floors are exceptionally practical, durable and wear-resistant. Natural stone is resistant to temperature changes, scratches and mechanical damage. Stone floors are easy to clean from various contaminants, especially if you use special detergents. The flooring will not lose the magnificent look and aesthetic properties for decades and the market offers a great variation of patterns, textures, smooth polished surface or other finishes. However, like all natural materials, stone requires special care. Due to the porous structure natural stone can be stained, it needs to be protected wit sealants. 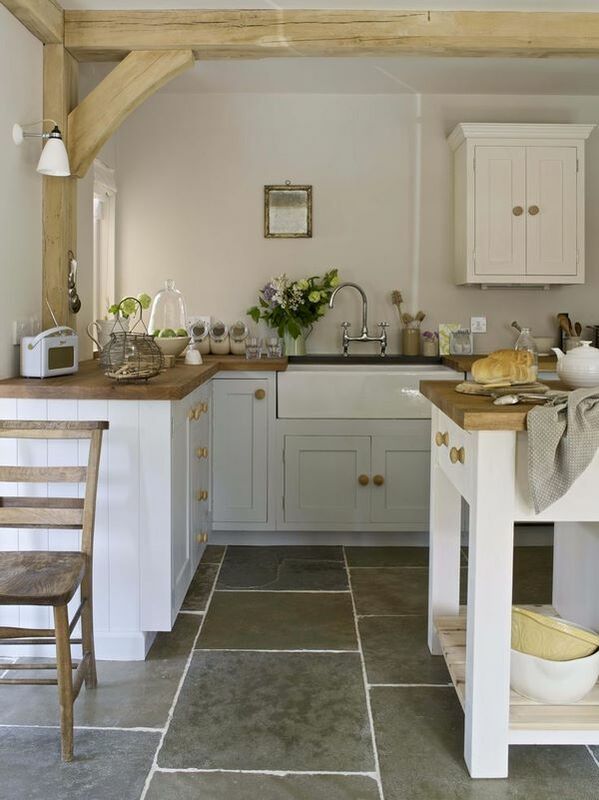 Another disadvantage – stone flooring poorly retains heat, which makes them “cold” floors. You may have to install an under floor heating system. Natural stone can be quite expensive, depending on the variety you choose, and it is necessary to hire a specialist for laying it. 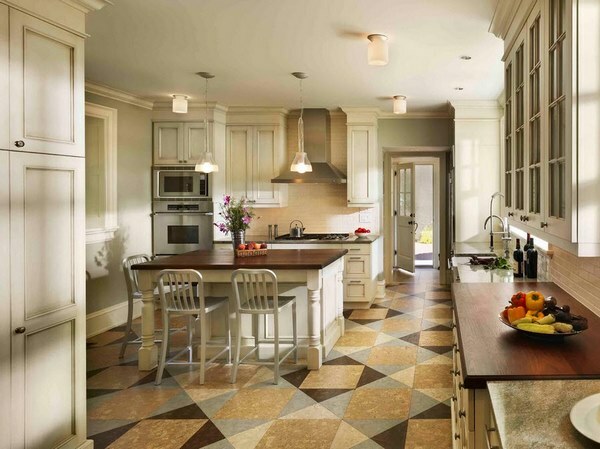 Marble, granite and sandstone are good options for kitchen flooring. Granite is very hard, and sandstone is eventually covered with a gray color natural patina. 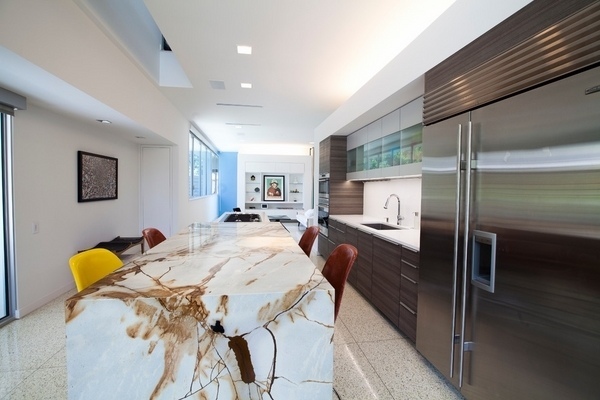 Marble in the kitchen looks just fine, but requires special care. For such a coating, oil-free impregnation is necessary. Otherwise, oil stains will be absorbed into the structure of the material and become visually distinct. Moreover, scratches and potholes remain on the surface of the marble. 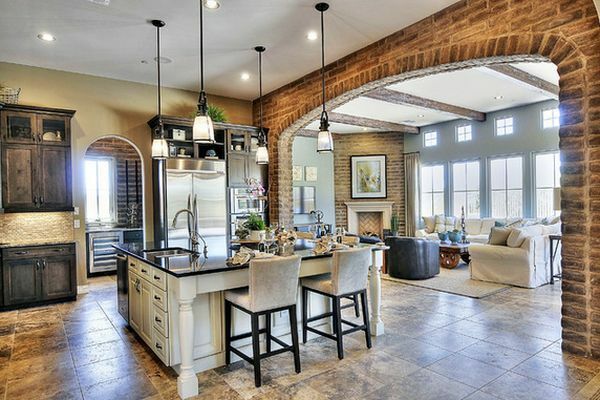 Brick floors are solid and strong, they contribute to the interior with their own unique artistic quality and the natural colors of clay and if you wanted to make a statement in a kitchen, this is your flooring. Let’s look at the main advantages and concerns which you need to know. 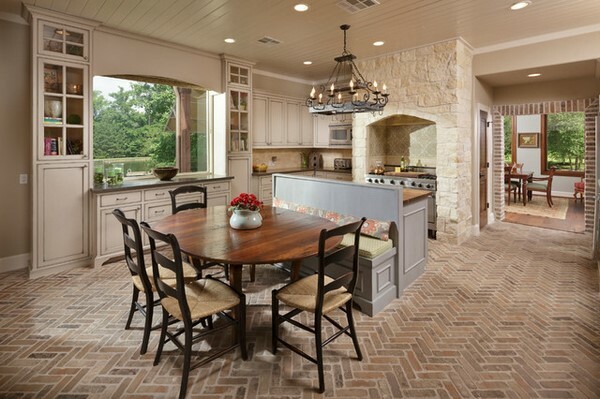 A brick floor adds texture and visual interest to the kitchen interior. These floors are warm, durable and low maintenance. Bricks are non slippery even when wet and retain heat very well, which makes them comfortable to barefoot. In addition, bricks are environmentally friendly and recyclable material. Bricks come in different color options and and can be arranged in a variety of patterns. Basically, the color depends on the ingredients and the manufacturing process and ranges from soft shades to deep, dark crimson hues. 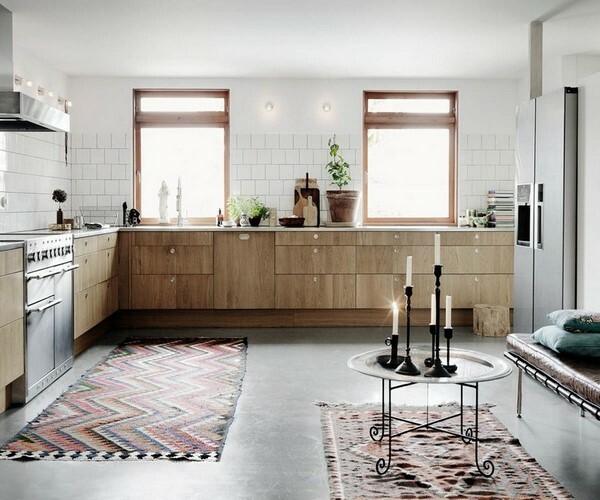 One of the main considerations that you need to keep in mind is that brick floors are hard and not really convenient if you had to spend a long time in the kitchen. An option is to use area rugs which will soften the feeling. Another major consideration is the fact that bricks a porous and susceptible to stains, water damage, growth of mold and bacteria. This means that you need to seal a brick floor to protect the surface and re-seal it periodically. 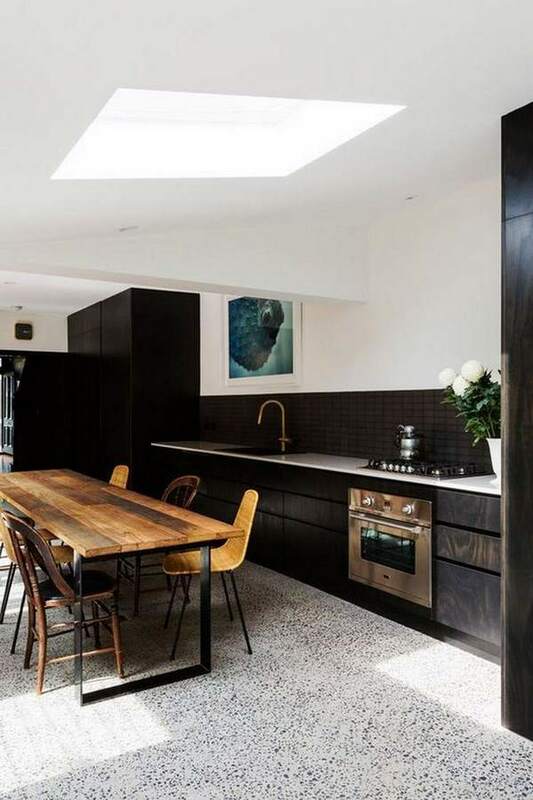 Rubber kitchen flooring – a good or a bad idea? 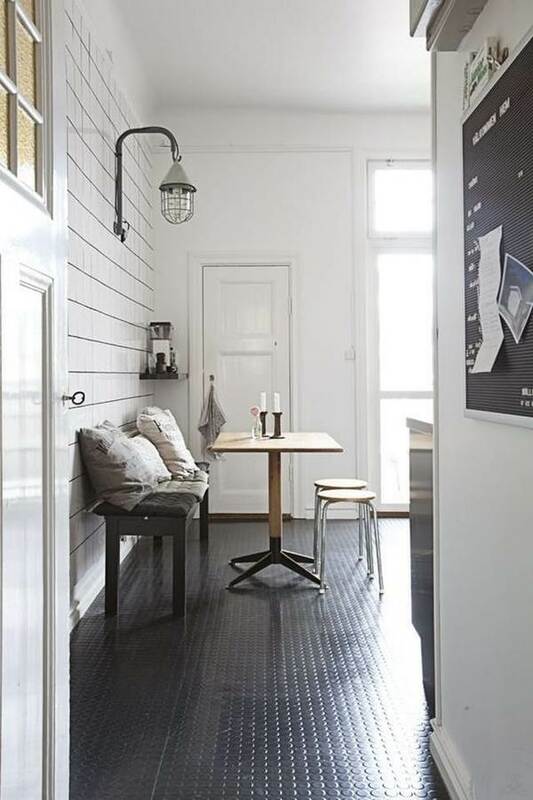 Rubber kitchen flooring is not among the top choices. 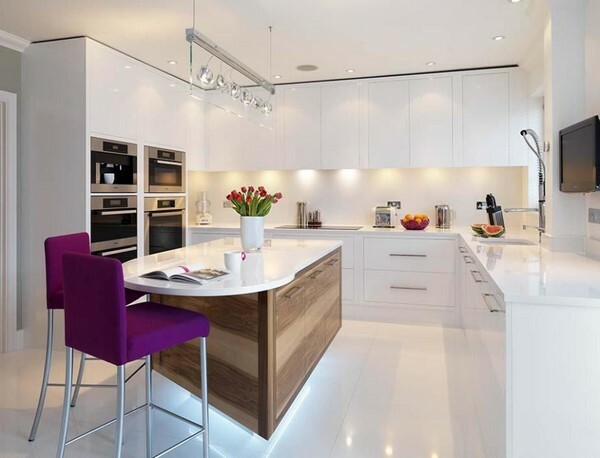 This is, perhaps, due to the fact that many people associate it with public areas, gyms, garages or home fitness and have not though that this could be a very practical and functional option for the kitchen. Natural rubber is really an ecological material, which in fact is not worse than any wood species. 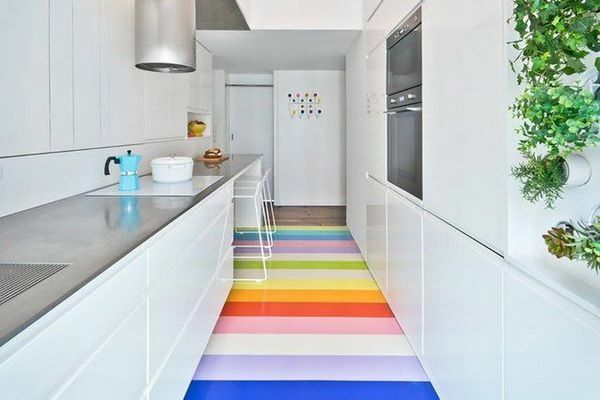 Rubber flooring is great for kitchen interior design, it comes in a variety of styles and colors and has many advantages. These floors are durable, waterproof, fire resistant, water resistant and are fairly easy to clean. 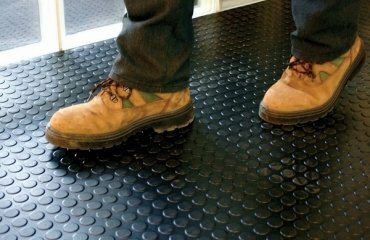 In addition, rubber flooring does not dent or scratch, it has one of the best sound insulation properties, it is recyclable and can last for twenty years or more. The market offers a huge variety of color options and textures to choose from. However, you need to keep in mind, that rubber is susceptible to grease stains, and needs to be waxed periodically. Appropriate maintenance will make it more resistant to damage and discoloration. A good rubber coating is an expensive, although you can buy cheap rubber cover for the kitchen, but the look and feel of the material will be completely different. If the floor has a smooth texture, then there is a danger of slipping, so it is better to choose rubber with a rough or ribbed surface. The flooring may eventually lose color. 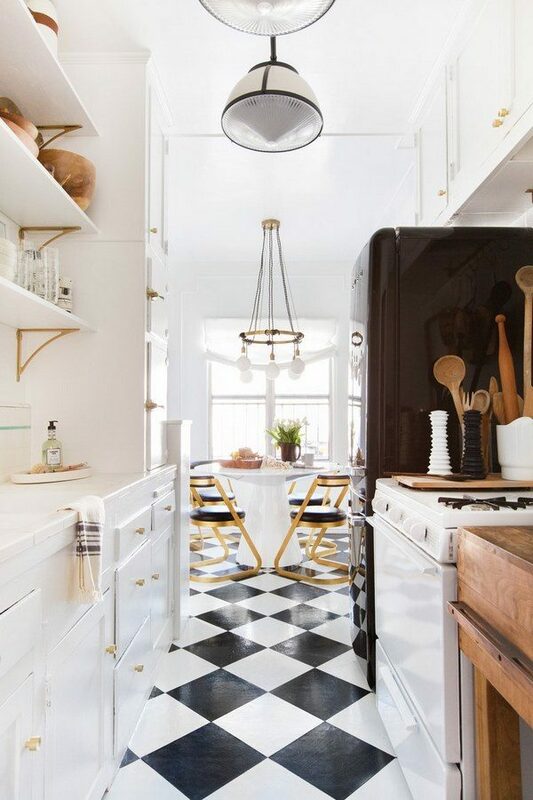 Rubber flooring in the kitchen is a good solution if you need a soft material, resistant to moisture and mechanical damage, which can be easily cleaned of dirt. 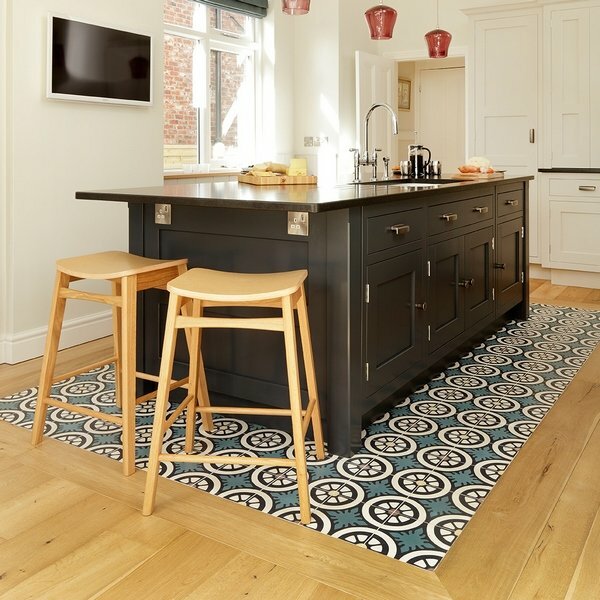 Kitchen carpets are widely popular but not as a main floor covering. 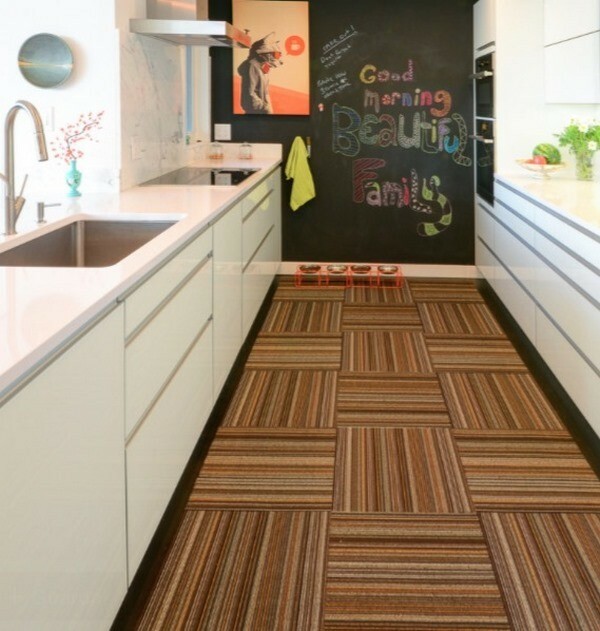 Despite their aesthetic appeal, a wall to wall carpet in the kitchen is not the best option. Carpets, however, are the ideal choice to soften the appearance and feeling of hard and cold floors. 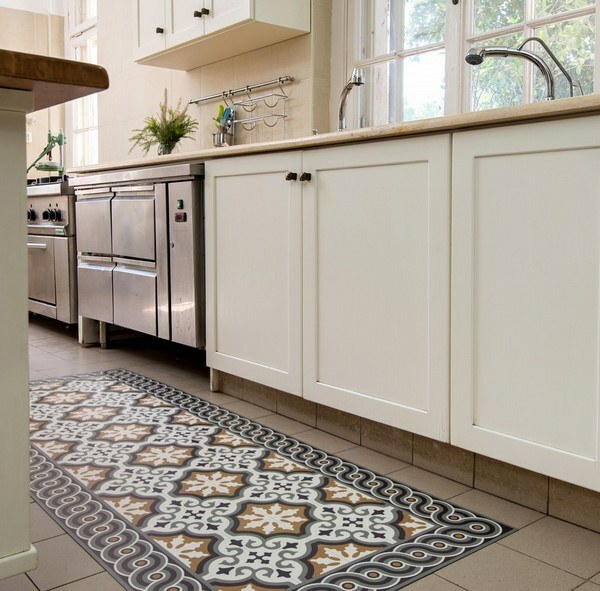 If your kitchen has a cold tile floor, a carpet can make it warmer, more comfortable and will also muffle sounds. 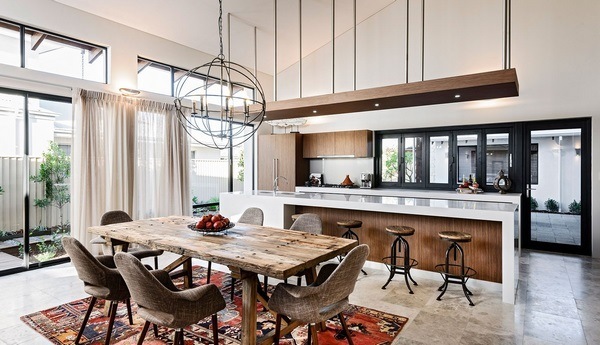 In a studio apartment or simply in a large kitchen, an area rug can become an original way of zoning the room: with its help you can separate the dining area or separate the work area from the rest of the space. In addition, carpets can hide and disguise any shortcomings of the existing kitchen floor. The carpet will protect the floor surface from damage, dents and scratches if objects fall from the table or the countertop. 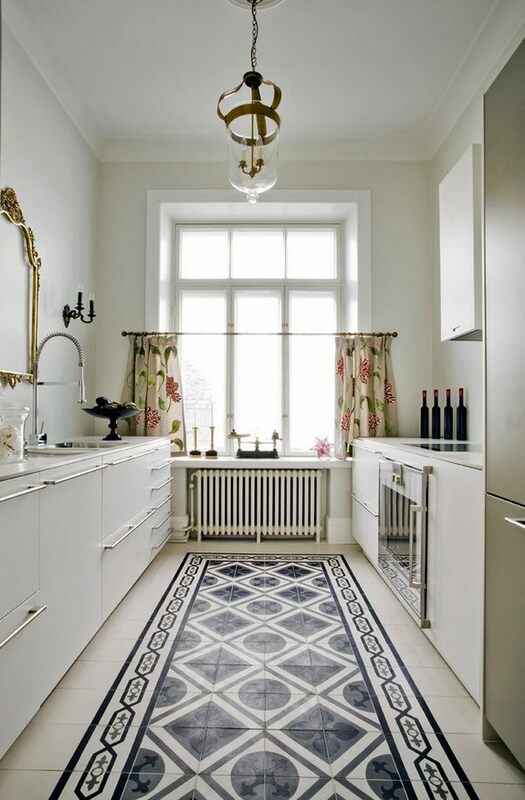 The carpet helps to make the design of the kitchen room original and stylish. 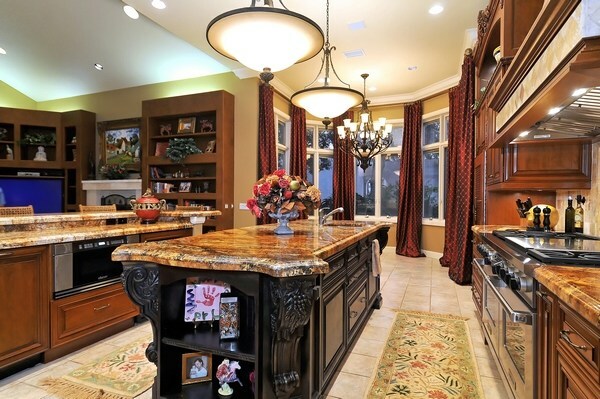 Typically area rugs or kitchen mats are placed at the sink, the dining area and the countertop (working) area. 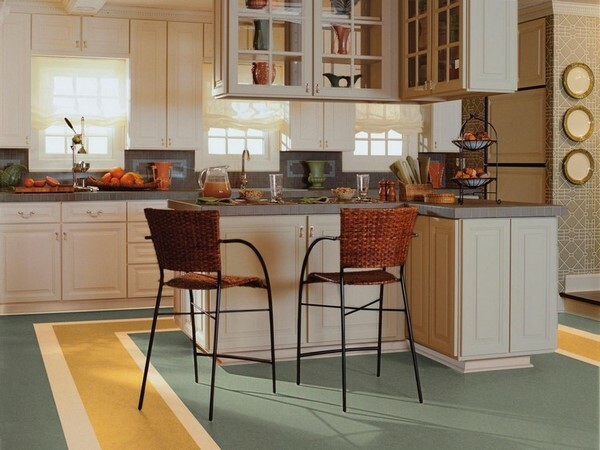 The right choice of the size and shape of the carpet is of great importance for the overall appearance and harmony in your kitchen. In a small room a large carpet will be inappropriate, one or more small rugs or mats will look way better while in a large room you can lay one big or several rugs of different sizes, combined in style. 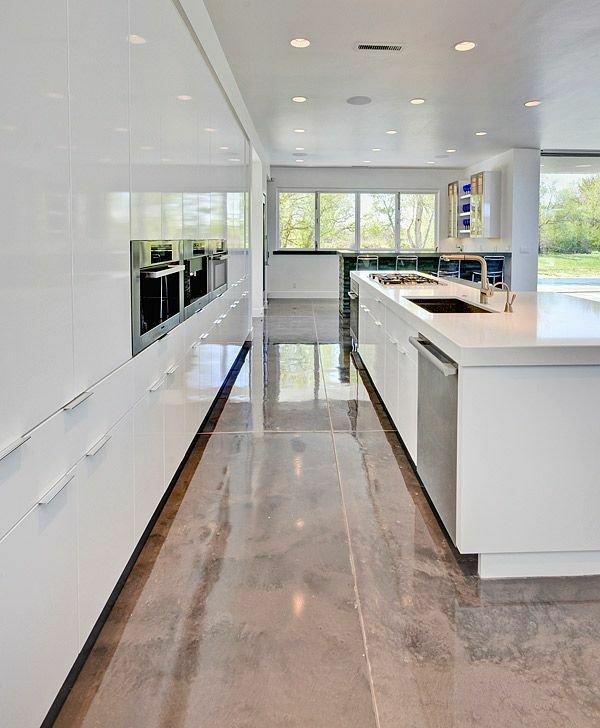 Epoxy flooring – is it a good choice for kitchens? Epoxy floors are stunningly impressive and exceptionally beautiful. More often they are used in high traffic public areas and areas with high humidity levels. When we talk about advantages and disadvantages of different kitchen flooring options epoxy floors have their place have to look at their pros and cons. 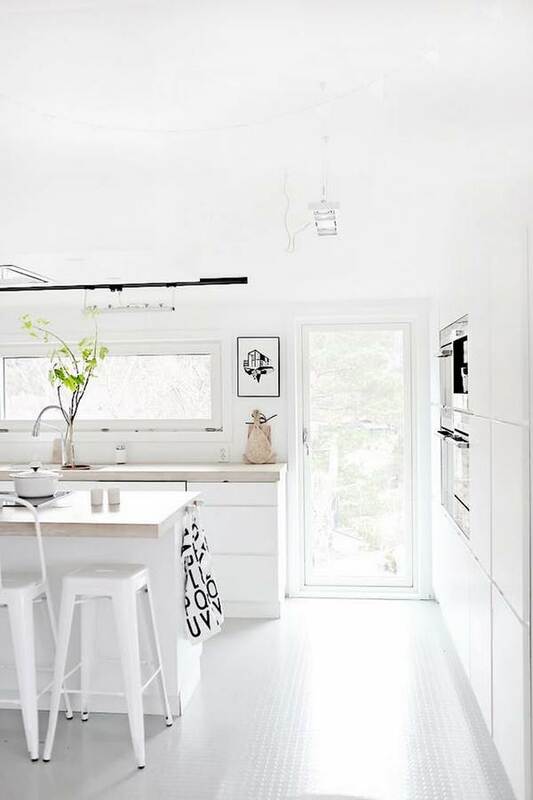 On the first place, epoxy floors have an outstanding appearance, they are an immediate eye catcher in every room and their bright, sleek, smooth and elegant shiny look is often the WOW factor in the interior design. 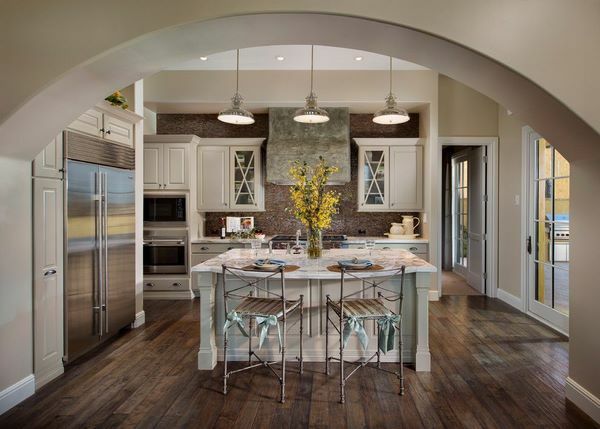 Homeowners have the possibility to choose between a variety of colors, personalized patterns and even 3D designs. The durability and resistance of epoxy floors are excellent. These floors are resistant to bacteria, germs, temperature changes, chemicals, water, staining, mechanical damage, etc. and if you need an indestructible floor, well, this might be just the one! When properly installed, an epoxy floor will last longer than most of types of flooring and you will enjoy a perfect floor for decades without any signs of wear, cracking or peeling. When it comes to installation, you can do it directly on an existing concrete, wood or other floor type, as long as they are level. Except for the fascinating appearance, these floors are easily maintained and in addition to all that, they are not expensive. Do epoxy kitchen floors have shortcomings? Yes, of course, like any other material. Their smooth surface can be slippery if you spill something. Chips and cracks may also happen, but most often they would be as a result of improper and unprofessional installation. Repair and replacement is time and labor consuming, requires special equipment, knowledge and experience. When you can not decide on the material, then you can consider combining different floor coatings. This not only allows you to lay down both of your favorite coverings but also visually divide the functional areas in an open plan kitchen. What is the advantage of such separation? 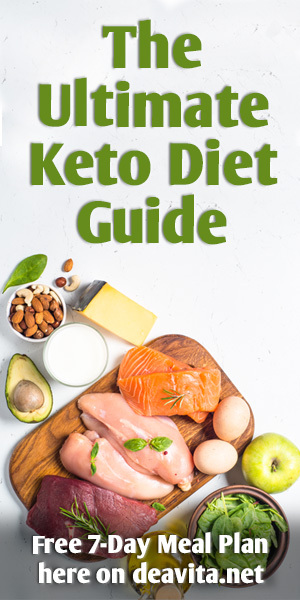 It allows you not to be afraid of getting water and fat on the floor in the “kitchen” zone, while maintaining a feeling of comfort and warmth in the dining room. For example, the working area can be covered with tiles, which are not afraid of moisture and fat, and the dining area can be covered with cork or solid wood. 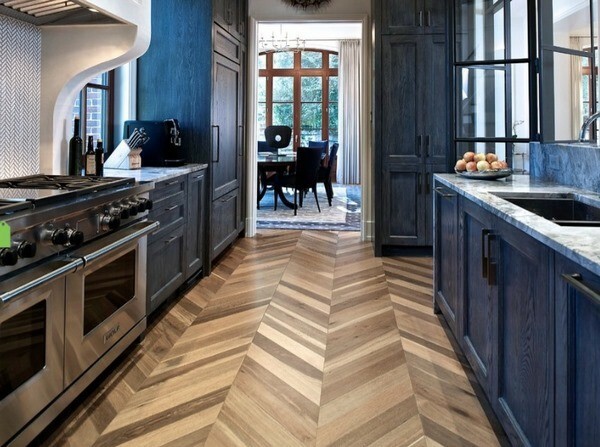 What do you need to know when combining different flooring materials in the kitchen? 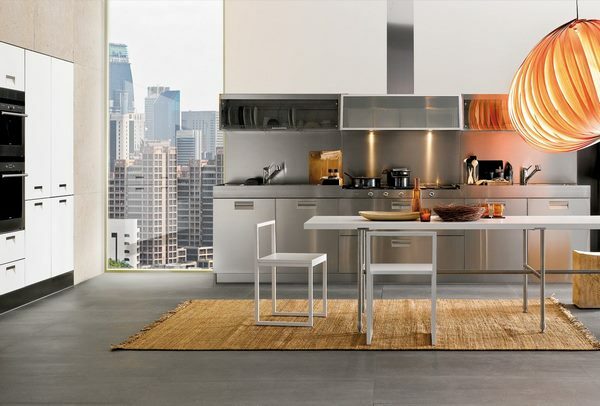 It is important that the materials you choose work harmoniously when combined and that they are suitable for the overall design concept of the kitchen interior. 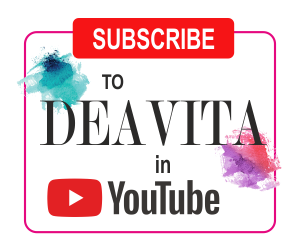 You can opt for matching colors or contrast combinations, whichever is appropriate for the individual designs and meets your personal criteria, taste and preferences. 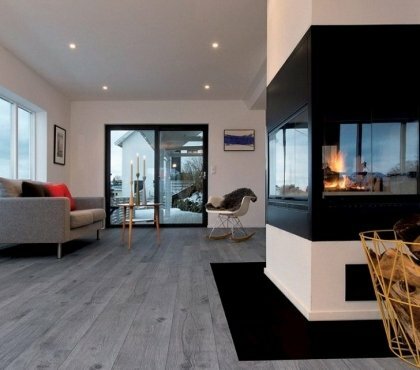 Combining flooring materials requires some knowledge for their properties and characteristics as well. In conclusion, we hope that our recommendations and ideas will be helpful to you and you will be able to make the best choice for your kitchen flooring. Grey hardwood floors – How to combine gray color in modern interiors?